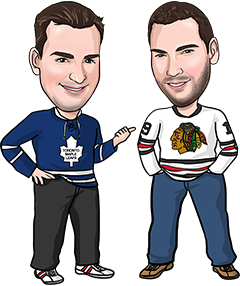 The #1 question we get from our friends and people on here is: Is online NHL betting legal? There’s a lot of misconception out there about what’s legal and what’s not. We’re not lawyers, but we’ve read the laws and we don’t live in any fear of police raiding our houses. In most cases, yes, online NHL betting is legal. Just how legal depends on where you live. Is Online NHL Betting Legal in Canada? If you’re a Canadian, you’re good to go. Canada holds a very relaxed view on gambling, compared to some countries. The Canadian Criminal Code prohibits anyone in Canada from accepting single-game wagers, but nothing in the Code suggests it is illegal to bet online. Canada also does not have any law like the Wire Act in the U.S.
Not only that, several online sportsbooks (like Sports Interaction and Bodog) are located IN Canada. We know many people who make a living sports betting in Canada, and they’ve never been prosecuted. We don’t see how that doesn’t make online NHL betting legal in Canada. Is Online NHL Betting Legal in the United States? If you’re in the United States, things are a bit more difficult to do online NHL betting. The Wire Act makes it illegal to use a wire communication facility (like a telephone) to place bets in the U.S., though it’s important to know that the Supreme Court hasn’t ruled on how that applies to online betting. The U.S. also passed the Unlawful Internet Gaming Enforcement Act in 2006, making it illegal for gambling businesses to accept payments from American bettors – but NOT making it illegal for Americans to use online sportsbooks. Sportsbooks like BetOnline and Bovada openly accept Americans, and they’ve been doing it for years. Even with the recent crackdown on daily fantasy sports, government is only going after the businesses that offer the betting, not the bettors themselves. The U.S. government seems to have kept online NHL betting legal, but it depends on what you’re comfortable with. Is Online NHL Betting Legal in Europe? If you’ve seen the movie Euro Trip, you know pretty much anything goes in Europe. That includes sports betting. Try watching a soccer game without seeing a zillion sportsbook ads. And we hear you can’t walk a block in England without running into a sportsbook like William Hill or Bet365. If you’re in Europe, you’re pretty safe to think online NHL betting is legal. Some sportsbooks don’t accept players from certain countries, however. If you’re not sure which NHL sportsbook you can join, check out our reviews or shoot us an email. We’re happy to help. – If you’re still wondering is online NHL betting legal or you’re not sure, consult a lawyer.